Many large and giant breeds are identified with specific limb and joint conditions. Great Danes are susceptible to some of these conditions. Bone disease is often the result of factors other than genetic in these large and giant breed dogs. Great Danes are sometimes subject to lameness during their heavy growth period from between four to eighteen months of age. Assuming the reader has done his or her homework and gotten his or her dog from an ethical breeder who has taken advantage of testing and genetic registries (OFA, PenHip, CERF-for example)-I will go on to other reasons for orthopedic problems. High intake of calcium is associated with various bone diseases in Great Danes. Some dogs are at risk for osteochodrosis (OCD). Diets high in protein also increase the growth lameness tendencies for large dogs. 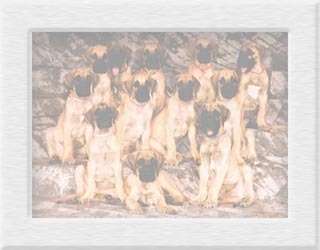 Most breeders also recommend that no vitamin or mineral supplement (other than Vitamin C) be given Great Danes. This disease often causes temporary or permanent lameness in dogs. This happens when the normal process of bone growth results in cartilage that is replaced by bone, and growth regions are overgrown. This can affect; shoulder, elbow, hock and even the stifle. Protein intake should be less than 25% to help prevent this condition-slower growth may help prevent OCD. Give NO calcium supplementation, feed NO puppy foods, as they usually have higher calcium/mineral content. If you have to have a bone disease, this is the one you want. It will go away. It is a self-limiting disease that could be called "doggy growing pains". It should not, however, be ignored. This condition affects the long bones of fast growing young dogs. Lameness is acute and painful, but is not related in injury. Lameness goes from one leg to another, and may go away without treatment. Limit activity, treat pain (usually with analgesics), lower protein to less than 20% for a few months to slow down growth. Talk to your vet about MSM as a means to aid rehabilitation. Stronger pain medication is available, but should be used with caution and only under veterinary supervision. This disease may be caused by excessive caloric intake in relation to energy expended. More in, than out! This usually affects Great Danes between the ages of 12 weeks and 7 months of age. First signs are a swelling in the front wrist areathis area is usually hot and tender to the touch. (Progresses to faulty rear movementbecause of pain in the lower back legs). Then, there is a dropping of the front wrist (pastern), splayed feet (toes are spread out or flat), the topline (the top of the back) gets curvy (like a Greyhound), and the back legs are tucked under the body (like a Deerhound) making the dog appear deformed. Sometimes the rear legs look "cow hocked" (feet face outward and hocks face towards each other) and the front legs may toe inward. In some cases the dog will toe out; when viewing the puppy from straight above the shoulders down to the front feet the legs will have a knock-kneed appearance. In extreme cases there are very high fevers, refusal to eat, and constantly aching joints. This is caused by high protein foods consumed in larger amounts than is actually needed by puppies. Puppies do better on a high quality, lower protein food ranging around 20% to 25%. Adding "people food" can raise the protein levels or imbalance the calcium/mineral ratio. Keep your puppy well-fleshed, but not fat is better. Remember, slow steady growth will do more for your puppy than rapid growth that can happen with puppy foods. The puppy will eventually reach its genetic potential, but without the additional risk to bone that comes from high proteins and supplementation (calcium/minerals) or puppy foods. It is obvious that nutrition is a big part in bone disease in Great Danes...it is really over-nutrition that is the BIG PROBLEM; too much protein, too much calcium/minerals, too much food. Dont be so nice to your dog you cripple it or kill it. Do not feed puppy foods; even those developed for giant breeds. Use a quality brand of dry food. Compare labels and get an adult food with lower calcium and protein content. Dont add milk or dairy products to moisten the puppys food. Use warm water instead. Dont give vitamins or minerals; especially calcium. The only vitamin supplementation considered acceptable is Vitamin C. Dont let your Dane puppy get roly-poly fat. You should be able to see the silhouette of the last rib. Never make diet changes suddenly. Any change should be made gradually over the course of a week. Allow your Dane puppy as much free exercise as he wants. However, never "road work" a young or adolescent Dane until their growth plates have closed. Distribution of this pamphlet is free and part of a joint educational effort. If you found this information helpful, please make a small donation to your local Dane rescue group.